22.5" x 14.25" x 11.125"
In the back of my mind began to enter in the idea of using the residency to create a single piece, taking the opportunity for immense concentration and focus that I would not have otherwise. The format of a strong box or Coffer quickly came to mind as a the perfect object through which to pursue this idea. I think it is worth giving some background of my work as a means of giving context to this piece. I received a BFA in Jewelry and Metalsmithing Design, and during the end of my time in school I became interested in forging. In fine metals I found that I worked well with the precision needed to create quality work, and in forging I was drawn to the malleability of the material and the scale in which I could work. It was not until I visited Musée Le Secq Des Tournelles in Rouen, France shortly after graduation that I realized how those two interests could intersect. The locks and utilitarian objects I saw there were unlike anything I had ever seen, and still influence me today. In the studio I am always pushing myself, both in design and technique, to build upon the skills I already have. From a technical standpoint, forging a static object – such as a hammer – is relatively simple. A next potential step in this progression is to make an object with moving parts – such as dividers or a hinge with a simple pivot. From there, a lock is an exciting challenge because a key, levers, bolts, and springs all need to work in unison to cleanly and efficiently perform a task. Design investigation for the Coffer was done by researching collections in person, in books, and online. Primarily I looked at lock work that was made between the 17th and 19th centuries. The goal was not to gather information in an effort to historically reproduce an object, style, or motif, but instead to familiarize myself with potential mechanisms. When it comes to design aesthetics, I try to absorb all the visual information and then begin designing. I will often find a certain line, curve, or detail to reference, but primarily I trust my judgment and decisions with hope that I will distill the aspects I was most drawn to and to articulate something that is uniquely my own. The piece as a whole is cohesive because I set myself up with a visual language early on and then drew from that language as new parts were designed and created. Historical examples guide me in making a piece in the way I most enjoy working – with the forge and the file. The other major part of the research was done in the studio, making models and samples as needed. There were the standard samples I needed to make in order to work through designs, but I also did experimentation and research on new techniques. One example is seen in making the springs. Through my interest and research into clock making I learned of one way horologists make springs for their movements. Although I was making springs that were much larger, with some experimentation I proved I was able to apply the same process for the Coffer. The Coffer was made primarily through handwork at the forge and at the bench. The majority of pieces, including the bolts, levers, and staples, are made from wrought iron, a material I use primarily for its working properties (enjoyable to forge and file). Wrought iron is no longer manufactured, so each piece needed to be forged from salvaged material. The forging is done using a coal forge, hammer, anvil, and power hammer. Once the pieces are forged as close to their finished shape as possible, I move to the bench to refine the surface and shape with a file. The final touch is a bit of file embellishment. 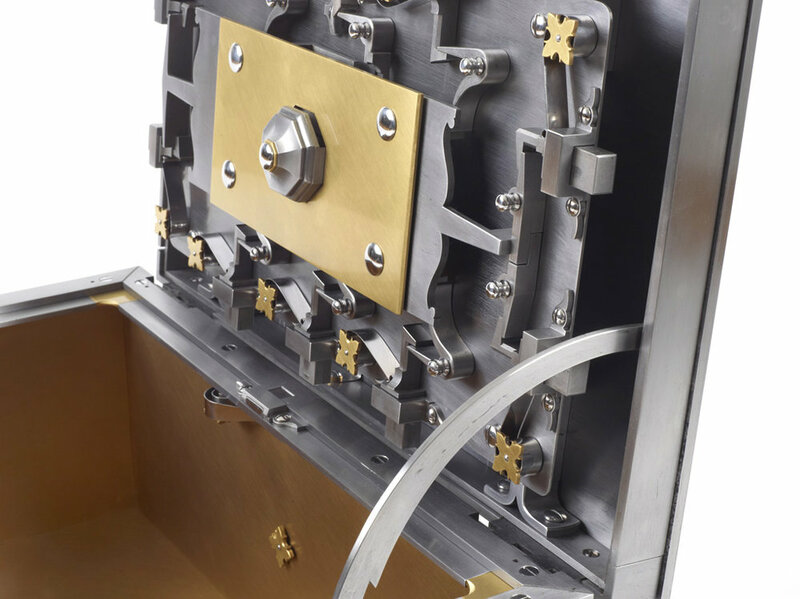 Other major components of the Coffer include the springs, screws, keys, and molding. Each screw is made through a combination of machine and handwork. The springs are made from high carbon steel that I polish, wrap, heat treat, and polish again. The keys are each fabricated out of three pieces. The bows are wrapped and forge welded, and the bits forged from solid material. The stem of the hollow key (and its corresponding barrel) is chased cold to achieve its concave-triangular shape. The molding that frames the outside panels was made using a die specifically made to forge lengths of wrought iron under the power hammer. It was then filed, mitered, and riveted in place. Although the Coffer was engineered and made with precise tolerances, I consider the creation of the piece to be quite organic. Each piece is made to fit the one before it, and each screw is made for its place. This is the way pre-industrial revolution locks (and many other objects) were made and I choose to work in this manner not because it is “period appropriate” because it makes sense for this type of construction and because I find it extremely enjoyable. I am thankful for the time that my residency at the Penland School of Craft gave me and proud of the work I did during those three years. Ultimately I found the experience of making such an involved piece very rewarding and I am excited to see what evolves from the completion of the Coffer.